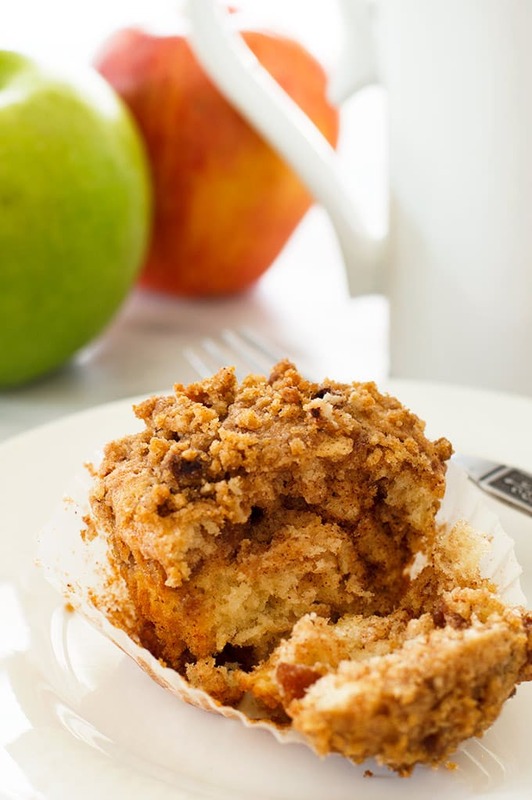 Tender apple crumb muffins with caramelized cinnamon apples and a crunchy crumbly brown sugar crumb topping. Make a batch for a teacher in your life! Here in my little part of California, school has been back in session for a couple of weeks. This means summer is over for all the kids out there, but also for the hardworking teachers who put so much time, effort, money, and love into their students. As someone whose mom and sister are both teachers, and who did a little substitute teaching right out of college (it *broke* me), I can say from experience that teaching is one of the toughest jobs out there. So this recipe is for them. 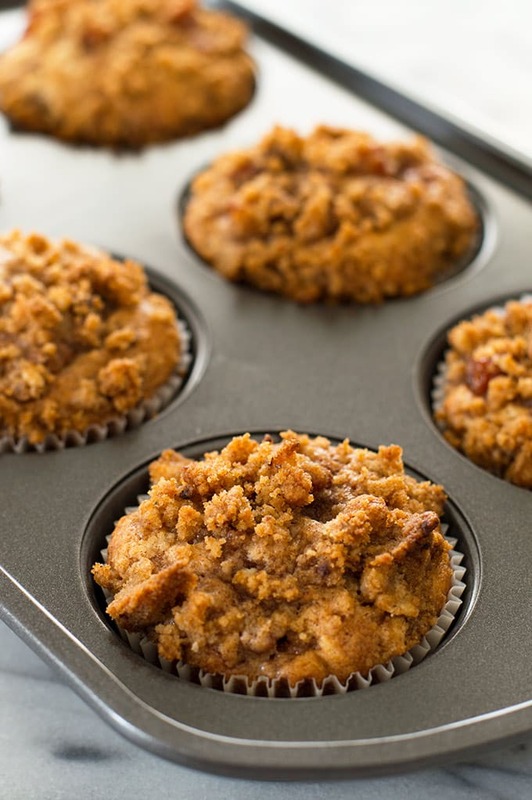 Instead of bringing your favorite teacher an apple, I hope you’ll make some apple crumb muffins for a teacher in your life. I did! 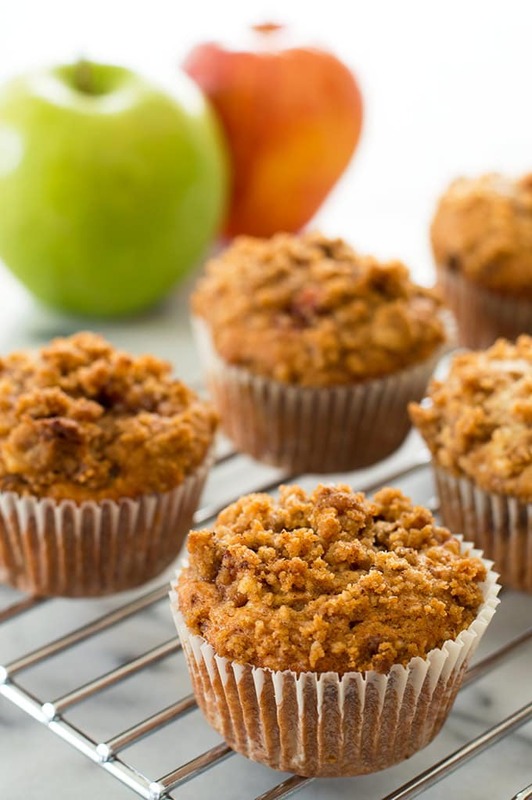 These muffins are an apple cinnamon dream, packed full of caramelized fruit, they are sweet, cinnamon spicy, and amazing. And the crunchy streusel top is just the icing on the cake. This is a super easy, straightforward recipe to make. You start with some diced apples–I like Granny Smith, but use your favorite baking apple–and cook them with butter, brown sugar, and cinnamon, until the apples are softened and brown sugar has caramelized into a thick, gooey sauce. Make up my quick and simple muffin base, made with either yogurt or sour cream (it’s up to you), so they are so moist and tender, and incredibly fluffy. Add the apples and let the brown sugar swirl its way into the batter. Then you mix up a simple brown sugar streusel, drop it over the top of the muffin batter, and bake. In about 16 minutes, you are going to have some big, beautiful muffins on your hands! Looking for some more teacher treats? Preheat oven to 375°F and line muffin tin with 6 liners. In a small saucepan, combine apples, butter, brown sugar, and cinnamon. Bring to a simmer, and cook until apples are softened and sugar is caramelized, 4 to 6 minutes. Remove from heat and set aside. In a small bowl, whisk together flour, baking soda, cinnamon, all spice, and salt. In a medium bowl, cream softened butter and sugar. Add egg white, yogurt/sour cream, and vanilla, and mix well. Stir in flour mixture until just combined. 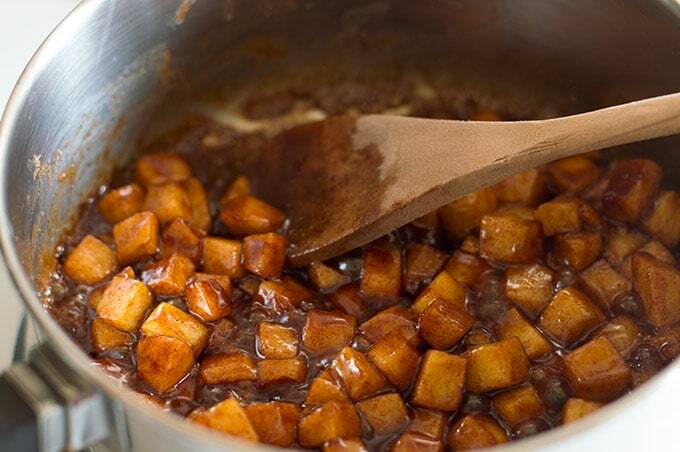 Fold apples into the mixture, making sure to scrape all the caramelized sugar out of the pan with them. Fold just until apples are distributed throughout the batter. You don't want to completely mix in the swirls of sugar and cinnamon. Divide batter between prepared muffin cups. In a small bowl, stir together flour, brown sugar, and cinnamon. Add in melted butter and stir until completely mixed. The mixture is going to seem a little wet, but don't worry about it. Drop small scoops of the streusel over the top of your muffins. Bake for 15 to 18 minutes, until a toothpick inserted into the center comes out clean. Cool in the pan for 10 minutes before transferring to a cooling rack. *1 cup diced apples is equal to about 1 large apple. If you are a little over or under 1 cup, don't worry about it. Granny Smith Apples are my preferred baking apples, but most apples (not Red Delicious) will work fine for these muffins. Oh my goodness, those diced apples with brown sugar looks soooo good!! That on it’s own looks amazing so I can only imagine the flavours that are packed in these muffins! These muffins look wonderful! And as someone who comes from a family of teachers, I totally agree it’s one of the toughest jobs out there! Ohhh nothing better than a crumb topping! These muffins look perfect! I keep seeing these little lovelies all over social media. They look PHENOMENAL!!! Oh man, you had me at “crumb muffin”. Anything with streusel/crumb topping is right up my alley. Totally agree. Crumb topping is the best topping. 😉 Thanks, Amy! Oh Tracy, this sounds crazy delicious! I can have these for breakfast everyday. I just made these – absolutely delicious!!!! Yay! So glad you enjoyed them. They’re definitely one of my personal faves! Great recipe! I made these and everyone loved them. I like the fact that you cook the apples with the sugar butter & cinnamon before mixing into the batter. So happy to hear, Patty! Thanks for reporting back! Will it make a difference if you use a whole egg? Some people have had success using a whole egg. I haven’t tried it, so I can’t say for sure without further recipe testing. If you do try it, please let me know how it works out for you! These muffins are really good! Lots of cinnamon apple flavour & a good amount of crispy streusel. Thank you, Laurie! I’m so glad you enjoyed them! These were extremely delicious!!! I used cottage cheese as I had no sour cream but they were just wow! I have no words!! Thanks, Nomsa! I’m so glad you enjoyed them!